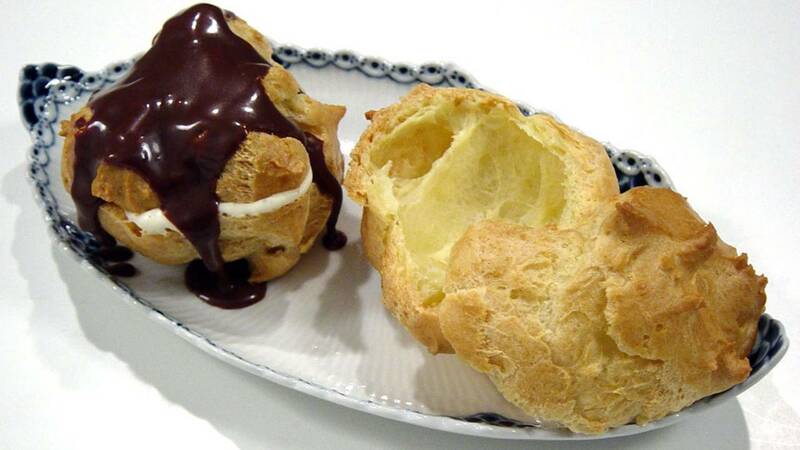 Video Recipe - The dough used for baking cream puffs, eclairs and profit roles is called a "choux" dough in French. The interesting thing about it is that you cook it in a sauce pan, and then mix in the eggs. The dough has the special feature that it largely becomes only crust when you bake it. So there is room for a lot of fillings. Although I have also seen it just covered with icing and used gingerbread man. Heat the oven to 200ºC (400ºF). Bring the water and butter to a simmer in a saucepan. When the water boils and all the butter has melted then add the flour and stir well. Use a whisk or electric mixer. Continue to stir until the dough is firm and no longer sticks to the spoon and pan. Let the dough cool a few minutes, until it is approximately the temperature of hot tap water. It should be hot, but not burn your fingers. Add the eggs to the dough one at a time and beat them well into the dough. The easiest way is to use an electric beater directly into the pan. But you can also pour the mixture into a stand mixer and use the meat-hook. The alternative is to use a heavy whisk and whisk by hand. But it requires a good wrist. When the dough begins to get the consistency of a wet dough, it is ready. Sometimes there is a need for additional eggs. It must be wet and sticky, but not as runny as a batter. Put the dough onto the baking tray on baking paper. Use 2 tablespoons. Or, put it in a freezing bag and pite it out in equal parts. Provide adequate space between each Choux. They become about twice as wide on each side when they bake. Bake them for about 20 minutes at 200ºC (400ºF) (convection). Do not open the oven door to check up upon them until they are almost finished. Otherwise, they will collapse. When they are finished then open the oven door halfways and let them cool in the oven. This reduces the risk of them collapsing. If you make multiple portions you may as well just take them out. Just cut a hole in the middle of them with scissors. The same place that you will later cut them to add filling. It releases the steam. Let them cool before you fill them with pastry cream (and possibly jam), chocolate mousse, whipped cream (possibly. stirred with crushed macaroons) or icecream. Choux Pastry Bar - "Wales Bar" it is called in Denmark. This is just a very long Cream Puff with the same filling options. You make this bar just like a very large Eclair. Put the dough into a freezing bag and pipe it onto baking paper in a long line. You just have to make a bigger hole in your freezing bag. 3-4 cm. (1½ inch) Or you can pipe 3 thinner lines out next to each other so that they touch and "merge" during the baking. Sprinkle with icing sugar through a sieve, or do a regular icing..